After having written Holes, Louis Sachar doesn't have to do anything for the rest of his life. 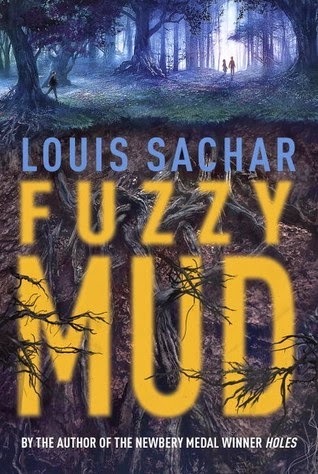 Instead, he has written Fuzzy Mud, a middle grade biological thriller. Not the obvious choice, but a welcome book to my classroom library. I'd love to include it on the summer reading list, but the August publication date makes it late for my school. I received a copy to review through Net Galley and have been waiting for months to share. When Tamaya throws some mud in the woods at bully Chad, she thinks she is just trying to protect her friend, Marshall. That's before her skin starts blistering and bleeding, and before Chad loses his vision. That's when the government gets involved, and things get really dangerous. Between Fuzzy Mud and The Fourteenth Goldfish, I hope there is a trend of science-minded books for young readers. There are lots of discussion points here, from overpopulation to biological engineering. Another bonus is that it will appeal to boys and girls, who will be able to relate to one of the three main characters. I plan to read this to my class as a treat, a sneak peak at a book before it is published. It will make a great read aloud.